Department of Pharmacy, Faculty of Biological Science, Jahangirnagar University, Savar, Dhaka - 1342, Bangladesh. ABSTRACT: Baccaurea ramiflora which is commonly known as Burmese grape is a commonly used medicinal plant in the South Asian folk medicine. They are potent in treating dermatological disorders and constipation. The aim of the study is to investigate the possible biological activities of B. ramiflora by determination of antioxidant activities of total ethanolic extracts through the free radical scavenging activity over vitamin C and the antibacterial activity using disk diffusion method. In-vitro antibacterial activity was evaluated against E. coli, P. aeruginosa, and S. aureus and Azithromycin was used as reference compound. IC50 were found to be 27.57 and 13.66 µg/ml for B. ramiflora and vitamin C respectively and the ethanolic plant seed extract exerted significant antibacterial activity at 500 µg, 1000 µg/disc concentration over the standard antibiotic drug which demonstrates the efficacy of B. ramiflora plant seeds extract. INTRODUCTION: Oxidative stress is considered as an important risk factor in the pathogenesis of several chronic diseases like diabetes, cardio-vascular diseases etc. Increased amount of free radicals and other reactive oxygen species are found to be involved in the pathogenesis of conditions such as atherosclerosis, diabetes and neurodegenerative diseases like Parkinson's and Alzheimer's diseases even cancers. Evidence also shows that, reactive oxygen species (ROS) are responsible for the human aging 1, 2. An antioxidant can be broadly defined as any substance that delays or inhibits oxidative damage to a target molecule 3. The key property of an antioxidant compound is its ability to trap free radicals. Phenolic acids, polyphenols as well as flavonoids are the antioxidant compounds which scavenge free radicals such as peroxide, hydroperoxide or lipid peroxyl and thus inhibit the oxidative mechanisms that lead to the progression of degenerative diseases 4. Since ancient times, herbal plants are considered as good antioxidant source for treating acute and chronic diseases. 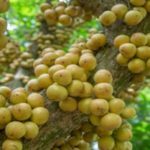 Baccaurea ramiflora also known as burmese grape is an evergreen tree belongs to the Euphorbiaceae family which is found throughout Asia, most commonly cultivated in south Asian countries like Bangladesh, India and Malaysia. 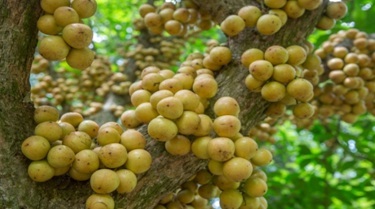 For south Asian people, the fruits of B. ramiflora is one of the valuable nutritional sources due to its enriched vitamins and minerals and the woods of the tree are used in furniture production because of its durability 5. In Chinese Dai medicine, the plant has been reported to possess anti-inflammatory and anodyne against rheumatoid arthritis, cellulitis and abscesses to treat injuries. The fruit juice of B. ramiflora have the efficacy to treat constipation 6. Hence, the aim of the current study was to evaluate the antioxidant activity of alcoholic extracts of seed of B. ramiflora by using DPPH scavenging assay and evaluation of anti bacterial activity. Collection of Plant Material: The B. ramiflora seeds were collected from Botanical garden of Jahangirnagar University campus, Bangladesh. The seeds were dried in shed and crushed manually with wooden arrangement and reduce in fine powder form. A voucher specimen has been archived in the herbarium Prof. Khairul Kabir (CBOT/JU) with code JU 15.318 ID. Extraction: The plant seeds were sun-dried first and then and dried in an oven at reduced temperature (< 70 ºC) to make the item suitable for grinding. The powdered plant seeds were submerged in sufficient volume of ethanol and methanol in an air-tight flat bottomed container for a week, with occasional shaking and stirring. The seed extracts were then filtered and dried on electrical water bath. Where, Ab is absorption of the blank solution and Aa is absorption of the plant extract. Evaluation of Anti-microbial Activity: The in-vitro antimicrobial tests of ethanolic extract of B. ramiflora against Azithromycin were done at Bangladesh Livestock Research Institute (BLRI), Bangladesh. Antibacterial activities of the ethanolic seed extracts was investigated by the disc diffusion method mentioned by Alzoreky and Nakahara 8. The ethanolic plant extracts were dissolved in 0.1 dimethyl sulfoxide (Gaylord Chemical. Inc., USA) in addition to MeOH. Four well-isolated colonies of the similar morphological type were chosen and inoculated into tubes containing 5 ml Muller-Hinton agar plate (Sigma-Aldrich. Inc., Germany) and incubated at 37 °C followed by shaking at 150 rotation per min for 24 h. The bacterial cells were counted using hemocytometer. For positive control S. aureus, P. aeruginosa and E. coli, Azithromycin discs (60 µgml−1) was used and ethanol solvent of the plan extract was used as negative control. To obtain result each studies were done in triplicates. Growth inhibitory activity was calculated by measuring the diameter of clear zone around the disc using a ruler 9. Antioxidant Activity: The antioxidant activity of ethanolic extract of B. ramiflora seed was measured by the ability to scavenge DPPH free radicals comparing with ascorbic acid (vitamin C). The free radical scavenging effects of B. ramiflora plant extract and the standard substance on the DPPH radical were expressed as half maximal inhibitory concentration (IC50) values; the results are reported in Table 1. Lower IC50 value reflects higher DPPH radical scavenging activity. According to the results obtained, the ethanolic extract of B. ramiflora seeds showed significant DPPH activity with the IC50 value of 27.57 µgml-1, while IC50 of ascorbic acid (vitamin C) as standard was 13.66 µgml-1. Different experiments have been performed to identify the free radical scavenging activities of the plant extract 10. DPPH is a compound which has significant free radical scavenging ability and shows good absorbance at 517 nm 11. Ascorbic acid (vitamin C) is usually used as a standard anti-oxidant and it has a strong DPPH scavenging property 12. Our findings indicated that B. ramiflora extract showed promising antioxidant activity with 27.57 µgml−1 IC50 value. Antimicrobial Activity: The antibacterial activity of seed extract of B. ramiflora against the tested bacteria strains was evaluated using disk diffusion method. The inhibition zone produced by the plant extract on selected bacterial strains was between 7mm and 18 mm. Our antimicrobial study revealed that the ethanolic extract of B. ramiflora showed inhibitory effects on S. aureus, P. aeruginosa and E. coli as shown in Table 2. From previous studies, the plant has been identified as a important source for development of new therapeutic approaches. To achieve this target, the in-vitro antibacterial test was the initial step 13. The result of our in-vitro study clarified that the crude extract of B. ramiflora proved its efficiency to be used as a potential source for antibacterial compounds due to its inhibitory effects on S. aureus, P. aeruginosa and E. coli. CONCLUSION: Ethanolic extracts of B. ramiflora seeds have different levels of both antioxidant and antibacterial activity. Several studies suggest that, there is a strong relationship exists between total phenolic content of plants extracts and antioxidant and antibacterial activity. So the plant could be subjected for further studies to purify the active components which are responsible for the antioxidant and antimicrobial activities. ACKNOWLEDGEMENT: The key researcher, Pritam Saha Podder, is sincerely grateful to Pharmaceutical chemistry laboratory of Jahangirnagar University for providing research facilities too. Kanwar JR, Kanwar RK, Burrow H and Baratchi S: Recent advances on the roles of NO in cancer and chronic inflammatory disorders. Curr Med Chem 2009; 16(19): 2373-94. Chiavaroli V, Giannini C, De Marco S, Chiarelli F and Mohn A: Unbalanced oxidant-antioxidant status and its effects in pediatric diseases. Redox Report 2011; 16(3): 101-7. Yamagishi SI and Matsui T: Nitric oxide, a janus-faced therapeutic target for diabetic microangiopathy-Friend or foe? Pharmacological Research 2011; 64(3): 187-94. Wu Y-y, Li W, Xu Y, Jin E-h and Tu Y-y: Evaluation of the antioxidant effects of four main theaflavin derivatives through chemiluminescence and DNA damage analyses. Jour of Zhejiang University Science B 2011; 12(9): 744. Sundriyal M and Sundriyal R: Underutilized edible plants of the Sikkim Himalaya: need for domestication. Current Science 2003; 85(6): 731-6. Lin Y, Yi Z and Zhao Y: Chinese Dai medicine colorful Kunming: Yunnan National Publishing House 2003; 380. Wikler MA: Performance standards for antimicrobial disk susceptibility tests: approved standard: Clinical and laboratory standards institute First edition, 2006. Alzoreky N, Nakahara K. Antibacterial activity of extracts from some edible plants commonly consumed in Asia. Inter Jour of Food Microbiology 2003; 80(3): 223-30. Romero CD, Chopin SF, Buck G, Martinez E, Garcia M, Bixby L: Antibacterial properties of common herbal remedies of the southwest. Journal of Ethnopharmacology 2005; 99(2): 253-7. Pavithra K and Vadivukkarasi S: Evaluation of free radical scavenging activity of various extracts of leaves from Kedrostis foetidissima (Jacq.) Cogn. Food Science and Human Wellness 2015; 4(1): 42-6. Juan MY and Chou CC. Enhancement of antioxidant activity, total phenolic and flavonoid content of black soybeans by solid state fermentation with Bacillus subtilis BCRC 14715. Food microbiology 2010; 27(5): 586-91. Tona L, Kambu K, Ngimbi N, Cimanga K and Vlietinck A: Antiamoebic and phytochemical screening of some Congolese medicinal plants. Jour of Ethnopharmacology 1998; 61(1): 57-65. Nenaah EG and Ahmed ME: Antimicrobial activity of extracts and latex of Calotropis procera (Ait.) and synergistic effect with reference antimicrobials. Research Journal of Medicinal Plant 2011; 5(6): 706-16. Podder PS, Das R and Kundu SK: In-vitro antioxidant and antibacterial study of Baccaurea ramiflora seeds. Int J Pharmacognosy 2018; 5(9): 612-15. doi link: http://dx.doi.org/10.13040/IJPSR.0975-8232.IJP.5(9).612-15.